Background: Fear-inducing warning labels on tobacco products are widely used, despite theory and experimental evidence suggesting that fear appeals are ineffective and may even cause denial, disengagement, or maladaptive behavior. Purpose: To examine effects of plain packaging health warnings on quitting intentions and its predictors in smokers’ everyday life. 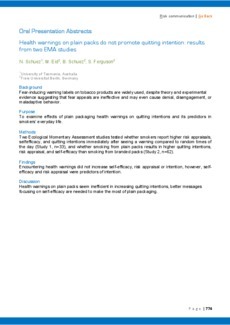 Methods: Two Ecological Momentary Assessment studies tested whether smokers report higher risk appraisals, selfefficacy, and quitting intentions immediately after seeing a warning compared to random times of the day (Study 1, n=33), and whether smoking from plain packs results in higher quitting intentions, risk appraisal, and self-efficacy than smoking from branded packs (Study 2, n=62). Findings: Encountering health warnings did not increase self-efficacy, risk appraisal or intention, however, selfefficacy and risk appraisal were predictors of intention. Discussion: Health warnings on plain packs seem inefficient in increasing quitting intentions, better messages focusing on self-efficacy are needed to make the most of plain packaging.